Growing up on a farm stays with you. You understand how rewarding yet hard it is to grow and harvest a crop. You appreciate the importance of the land. You know fresh when you taste it. You also value your neighbors and are there to help, just as your neighbors help you. That sense of mindfulness and respect, learned on my parents’ farm, is something I try to bring to my business every day. Beautiful artisanal chocolate brings pleasure to those who enjoy it and it’s brought a good life and business to me. I want to make sure others benefit as well. I’m passionate about working to ensure that cacao farmers and their families receive a living wage so they’re able to educate their children. 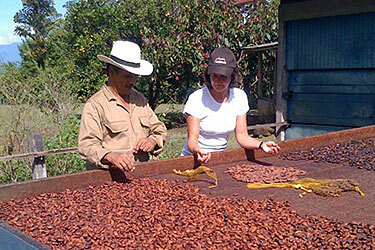 I’ve traveled to Costa Rica, Colombia, Ecuador, and Peru, living and working with the farmers. I choose farmers, manufacturers and importers who value biodiversity, sustainable agricultural practices and producing the finest quality ingredients. Most of the chocolate I select is not certified organic or fair trade. However, the practices used by my sources are organic and the wages are of fair-trade level or above. Certification costs farmers and small-scale manufacturers a great deal of money, making it out of reach for many even though they would qualify. And, unfortunately, organic and fair-trade certifications are no guarantee of quality. For me, seeing is believing. The health of the environment has always been important to me. Before reinventing myself as a chocolatier, I worked as a cartographer for the Wisconsin Department of Natural Resources. I grew up on a farm among the beautiful rolling hills of Seymour, Wisconsin. The land has always been a central part of my life. Opening my own business allows me to put my environmental beliefs into practice. All of the shop’s energy use is offset by wind and solar power, through Madison Gas and Electric’s Green Power Tomorrow program. My staff works to use water wisely and recycle ingredient packaging as much as possible. Many of us walk or bike to work. Given that cacao can only be grown near the equator, there’s an unavoidable environmental impact. 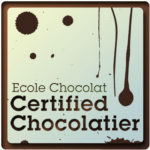 To minimize energy consumption, my chocolate is processed in the U.S. or South or Central America, rather than Europe. I also participate in the Big Tree Climate Fund, a program that offsets my company’s carbon usage by planting native trees in Brazil. Rishi Tea, a leading importer of premium, organic, single-origin tea, located in Milwaukee. Mountain Rose Herbs, providing fine organic botanicals, based in Eugene, Oregon. Just Coffee, roasters of organic, fair-trade beans in Madison, Wisconsin. I love the neighborhood where my shop is located. I’ve lived in the Atwood area since the early ‘80s and it’s never lost its magic for me. It’s uniquely Madison, with its small shops, fantastic restaurants and diversity of residents. That’s why the Goodman Community Center is so close to my heart. Since 1917, the center has provided programming and valuable resources for local residents, including a food pantry and meal programs. And that’s why all profits from our chocolate hearts support their efforts. I’m also an enthusiastic supporter of the Madison Area Community Supported Agriculture (CSA) Coalition. The group works to support a just, locally grown and sustainable food system. The group promotes and supports area CSA farms, educates both farmers and the community about the benefits of locally grown food, and raises funds to subsidize CSA memberships for families with limited incomes. Since opening my business in 2004, I’ve been fortunate to be able to grow. A lot of people helped with that. My employees are a large part of the story. They share my passion for creating extraordinary dark chocolate, contributing their talent, creativity, ideas and boundless enthusiasm. They’ve expanded my palate and skills in the kitchen. They always take the time to provide patient and caring service to our customers, whether it’s choosing an assortment of truffles or finding a special gift. Although it’s still a small business, I offer my 10 employees health insurance and retirement benefits. We do daily chocolate tastings, weekly potluck lunches and everyone gets to select local food from our weekly CSA deliveries. I have a happy shop, which you’ll feel when you enter our doors. 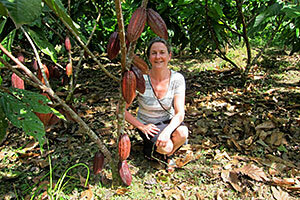 Gail Ambrosius Chocolatier supports Green Power. Watch this video to find out how it works and how easy it is to get involved!